For the batter of the tank cake I used a combo of dark chocolate and yellow cake mixes that I made from scratch. I used food color for part of the yellow cake mix to make it green. I poured the cake mixes in the pan by cupfuls, alternating colors to give a camo appearance, and then giggled it gently to mix it slightly and make sure everything was even in the pan. After the cake cooled I iced it with chocolate icing. Then I used a butter cream icing half dyed green and put that icing on by spoonfuls, alternating between the two colors. I found American flag tooth picks at Party City. For the gun I used a green Fruit Loops Cereal Straw and stuck a cake decoration out the end of it to look like it was being fired. The tracks were made out of a couple of Hershey bars and the wheels were Oreos. 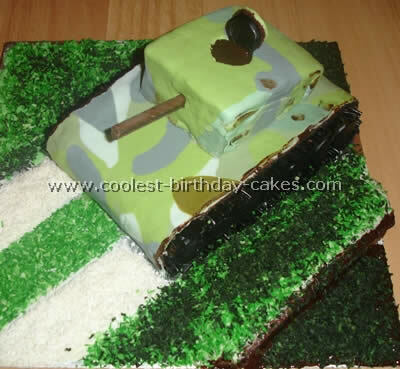 I got the idea for a tank cake from this website. I used three boxes of chocolate cake mix. I used two 9X13 pans and a large loaf pan (some mix left over). After they cooled I put the loaf in the freezer. I placed the two 9X13 cakes on top of each other and iced them. I used Oreos and black licorice for the wheels. I took the semi-frozen loaf and cut one side at an angle. I also cut a small hole in the top. I placed on top and iced. 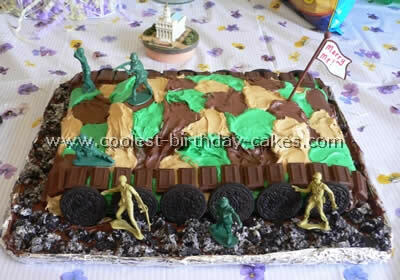 Put the army man in crumbled Oreos around for the dirt (as well as leftover cut cake) and put a flag in an Oreo. The opening of the tank is the top of an Oreo. Wasn’t sure what to use for the gun so used a small piece of the licorice. My son loved it! I made this tank cake for my son’s third birthday. First I used a 9×13 pan and a loaf pan. I cut the loaf in half so it wasn’t as tall and put it on top of the 9×13. Then frosted it white and used the cake spray paint. It works really well and it’s easy to use. I used black and green. For the tires I bought Oreo cookies and placed them on the side (I used a little frosting as "glue" so they would stick better) and for the treads I used black Twizzlers and cut them into 1" strips. For the dirt I crushed up vanilla and chocolate cookies and sprinkled them all around the cake. I frosted the board so they would stick better. I also ordered gummy army men and put those all around the cake. I took some of my son’s army guys and put one on top and around the tank cake and used a half of a cookie for the top door. I also got big pieces of card board and made life size army men, spray painted them all shades of green and placed them around the back yard. For activities we did a tug-of-war, a water bomb balloon fight, a tank pinata and a small obstacle course. Lots of fun- hope you enjoy! My husband is a history fanatic and he’s always watching war documentaries. 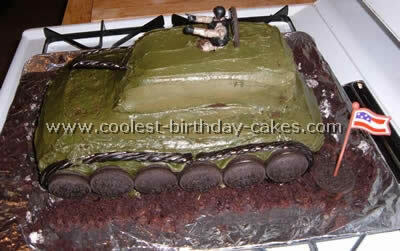 I figured a tank cake would be the most exciting birthday cake he’d ever had. The cake was a standard chocolate Victoria-style sponge made in a 13×9 cake dish. I used a Pyrex style because the edges were nicely rounded. I cooled the cake overnight in the freezer and while still cold I cut the cake in half to make the base. I then cut the turret from half of the remaining cake. For the topping I dyed several pounds of sugar paste icing in a variety of shades of olives greens and grays. Using the most olive colour as a base I rolled it quite thickly into a rectangular shape. I then cut each other colour into small camouflage shapes and using a very small drop of water positioned them around the olive colored circle. Using a rolling pin I carefully rolled the camouflaged pieces into the circle pushing in different directions to randomize the pattern slightly. Each cake piece was lightly brushed with a thin layer of white chocolate icing to allow the sugar paste to stick. I measured the top of the tank cake and cut the sugar paste wide enough to reach the sides of the tank but left the ends long to be able to tuck under the base of the cake. I then covered the turret with the remaining sugar paste but this time covering all sides. Then using some of the white chocolate icing I secured the turret onto the top of the base. For each of the treads I cut licorice twists in half lengthwise then in half across. Each was inserted under the sugar paste and secured with a little bit of black frosting. The wheels and hatch were made of licorice discs and secured with the same black frosting. The grass was made from colored desiccated coconut and the trench from the leftover cake covered in melted semi-sweet chocolate to make the mud. 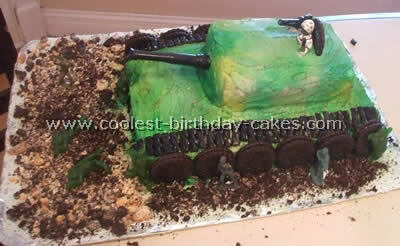 My son wanted a tank cake and I was wondering how in the world I was going to accomplish that. Then I stumbled on your website and couldn’t wait to get started. I knew it was going to turn out awesome! I simply made a 9×13 cake for the bottom and then made two 9” cakes, one for the top which I had to cut to make the turret of the tank. I cut the sides of the 9” round and cut an angle into it for the front of it. I made my own icing and used gel color to make the right shade of green. I simply set the cut piece of cake directly on top of the 9×13 and iced the entire thing. I added several pieces of black licorice for the tracks and used cheap chocolate cookies for the wheels. I had to cut the bottom off of some of the cookies so it fit right but it looked great anyway. Then I added a few of my son’s army toys to top off the look. 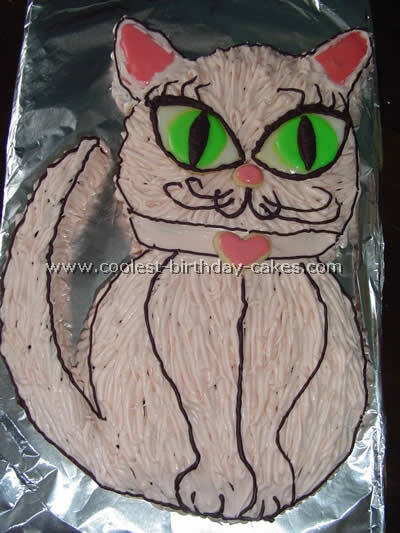 This was the best birthday cake ever. My son was so happy with it. And his friends thought I was the coolest mom ever! I made this tank cake for my best friend’s ten year old son. He’s really into the army thing. I used two bread pans to form the cake, one smaller than the other. I combined purple and red to make that dark army green color. I also used regular green and a milk chocolate brown. I iced the entire cake in the milk chocolate color and then used the star tip to pipe the camouflage color. The cannon is made from tootsie rolls wrapped around a straw. I used chocolate cookies for the wheels (if I make another one I’ll use Oreos because they don’t have such an ornate pattern to them). I smashed vanilla and chocolate cookies in a bag with a rolling pin to create the dirt for the platter. 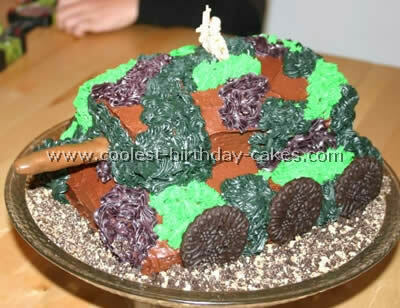 Enjoy making your tank cake, I know we did! I needed to make a tank cake for a groom in my family. He is about to go into the Army for boot camp so I wanted to make it into an army tank which seemed pretty simple. I saw the other tank cakes on this website. So here’s how mine turned out. Everyone loved it! I just used two chocolate cake mix boxes and one yellow cake mix box plus four icing tubs. I got brown gel dye and colored the icing so that it would make the various shades of tan brown dark brown. I put chocolate icing in between all the layers. There are two layers of the 9×13 rectangles for the bottom of tank. Then two loaf pans for the top half. I trimmed the excess off cut shape in tank and used cake cardboard to do the icing on with parchment paper underneath the edges all around so that when I was done icing I could remove the parchment paper and have a clean cardboard base. Then put the tan icing on the cardboard and put crushed up vanilla wafers on top to look like dessert sand. I added the chocolate licorice for the tracks and Oreo cookies for the wheels. I used black icing to write army and USA. I also stuck a small American flag on the tank lid but it is not in this picture. I made this tank cake for my son’s fifth birthday. He requested a military themed party. 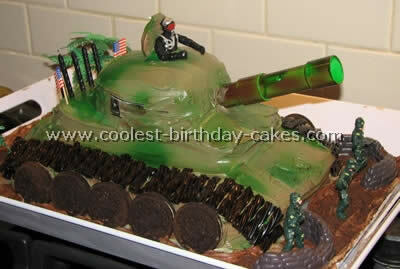 I found this great website and looked at the tank cakes. For the base I used a 9×13 pan and the top was a round pyre bowl. I found that the base cake was a little bit thin so I ended up using a small piece of cake to boost up the round turret. After letting the cake cool (overnight) I frosted it. I used chocolate and vanilla frosting mixed together to make a tan base. Then I took some white frosting and added green food coloring to it. I added this to the tan mixture very gently (don’t over mix) to create a camouflage look. I used this to frost the cake overall. After frosting it I used a spray frosting (green) to create more of a camouflage look (purchased at Michael’s). For the wheels I used Oreos. The crawler tracks were made of licorice. The lid for the turret hole was a frosted cookie. I used one of my son’s army men and stuck him in the top. The gun was a plastic flute that I spray painted. I also printed out "U.S. army" from a website and stuck that on the sides of the cake. Little American flag toothpicks were used at the top for more of a patriotic effect. 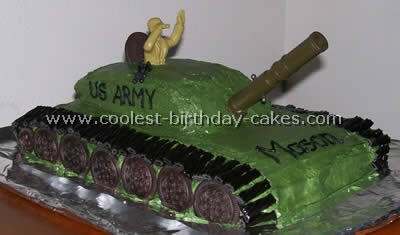 Everyone loved this tank cake and it was really much easier to make than one would think! This tank cake was for a bridal shower and the groom is in the military. I used a 9×13 pan for the bottom and turned it upside down on a pan wrapped in tin foil. Then I used a loaf pan to cook the top of the tank. I actually split my cake mix in half but I think that made the cake too short so I would use two different cake mixes and maybe add a little more to the larger pan. I turned the loaf pan cake over and used frosting to attach it securely to the top. I then used chocolate frosting for the brown, lots of green food coloring for the green and I mixed vanilla frosting with a little of the chocolate and seven drops of yellow food dye to make the beige color. I used Oreos for the wheels and small Hershey’s chocolates for the track. To make the dirt I spread a thin layer of chocolate frosting on my tin foil then crushed up the remaining Oreo cookies in the package and sprinkled them on the frosting. I got some old army action figures and added them for affect. 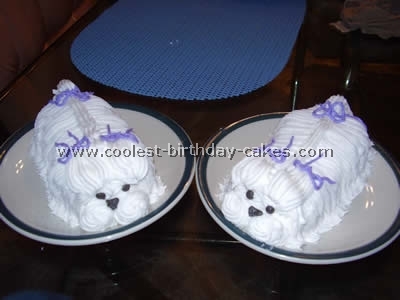 I got many of these ideas from this wonderful site for tank cakes. 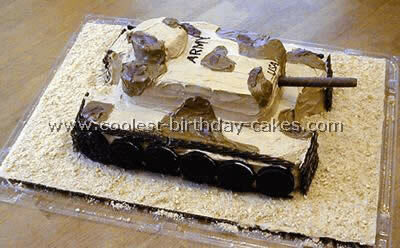 The idea for this tank cake came from this web site. A friend and I looked at all the pictures to get ideas and then got to work. We decided on marble cake mix to get the camouflage look inside also. We used green food coloring to get the white part green and then mixed in the chocolate. We used a cookie sheet to bake the cake, cut it in half and iced the middle with green icing and stacked them on top of each other for the height. The top of the cake is a loaf pan. We dipped Oreos for the wheels and a pretzel for the cannon in chocolate. 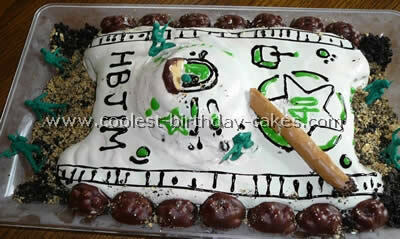 We iced the whole cake in chocolate and added the green and black spots to that for the camouflage look. I could not find a soldier that I liked so I took a picture of my son, cut it out and taped tooth picks on it to make it look like he was coming out of the hatch, which was a dipped Oreo. 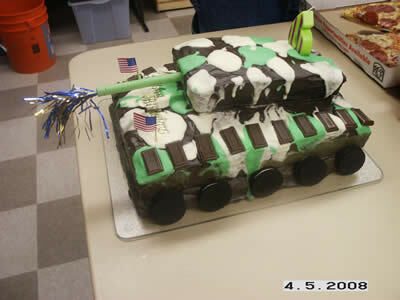 I got the idea for this tank cake from this great site. My husband is a military history buff but he really wanted an ice cream cake for his birthday. So I made a layered ice-cream cake in a 9×13 inch pan lined with plastic wrap. When it was completely frozen I inverted it onto a large platter. I cut out the contours for the crawlers and put an upside down plastic bowl for the turret. Then I frosted it with a mixture of ice cream and whip cream. The decorations are piping gel mallow cookies and chocolate cookies and graham crackers ground in the food processor for dirt. In retrospect I would have gotten a small cake for the turret so that I could stick the pretzel in it for the barrel. I should have also remembered to put food coloring in the frosting! A bit difficult working with an ice cream cake since the decorations wanted to slide around but party guests were impressed and the whole thing was devoured.